Julie Coberly is the Administrative Office Manager on the support team for Western Wealth Advisors. 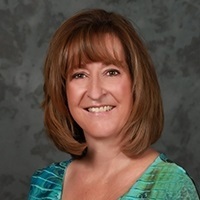 She helps Advisors with new Hybrid Registrations, Hybrid Compliance, Hybrid Commissions, Administrative Payroll and 401k administration, and escalated problem solving. Julie began working in the business in 1984 as a new business processor. During her 30 years in this industry she has gone from life and health new business processor, manager of the life, health, and brokerage new business department, commission and W-2 payroll processor, accounts payable, branch office budgeting, auditor, transitions, registrations and licensing, training new administrative associates, and facilitated quarterly administrative training sessions. Her favorite part of her job is problem solving because it allows her to help advisors and allows them to focus on other important issues. Julie has three grown children of her own and two step children. Together with her husband they have eight beautiful grandchildren. She enjoys baking for every occasion and trying out new recipes on co-workers because they always say it's good even if it's not!